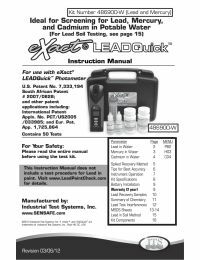 The eXact LEADQuick Advanced Photometer uses a patented method and technologies that offer faster, safer, easier, and more precise water testing. 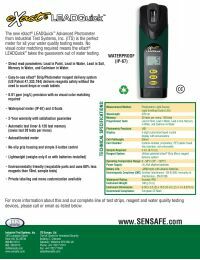 It offers direct read capabilities for five direct reads: lead in paint, lead in water, lead in soil, mercury in water and cadmium in water. Instrument dimensions: 2" x 1.4" x 6.375"
Note: To ensure optimal performance, store your eXact kit in a cool, dry place away from excess heat (below 100F/38C), moisture, and oxidizers such as chlorine and bromine.